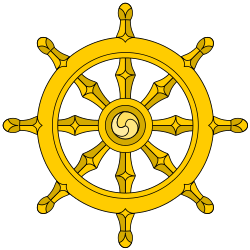 The Digha Nikaya (dīghanikāya; "Collection of Long Discourses") is a Buddhist scripture, the first of the five nikayas, or collections, in the Sutta Pitaka, which is one of the "three baskets" that compose the Pali Tipitaka of (Theravada) Buddhism. Some of the most commonly referenced suttas from the Digha Nikaya include the Maha-parinibbana Sutta (DN 16), which described the final days and death of the Buddha, the Sigalovada Sutta (DN 31) in which the Buddha discusses ethics and practices for lay followers, and the Samaññaphala (DN 2), Brahmajala Sutta (DN 1) which describes and compares the point of view of Buddha and other ascetics in India about the universe and time (past, present, and future); and Potthapada (DN 9) Suttas, which describe the benefits and practice of samatha meditation. DN 3 Ambaṭṭha Sutta Ambattha the Brahmin is sent by his teacher to find whether the Buddha possesses the 32 bodily marks, but on arrival he is rude to the Buddha on grounds of descent (caste); the Buddha responds that he is actually higher born than Ambattha by social convention, but that he himself considers those fulfilled in conduct and wisdom as higher. DN 4 Soṇadaṇḍanta Sutta) The Buddha asks Sonadanda the Brahmin what are the qualities that make a Brahmin; Sonadanda gives five, but the Buddha asks if any can be omitted and argues him down to two: morality and wisdom. DN 5 Kūṭadanta Sutta Kutadanta the Brahmin asks the Buddha how to perform a sacrifice; the Buddha replies by telling of one of his past lives, as chaplain to a king, where they performed a sacrifice which consisted of making offerings, with no animals killed. DN 6 Mahāli Sutta In reply to a question as to why a certain monk sees divine sights but does not hear divine sounds, the Buddha explains that it is because of the way he has directed his meditation. (alt:Maha Sīhanāda or Sīhanāda Sutta) The word sihanada literally means 'lion's roar': this discourse is concerned with asceticism. DN 9 Poṭṭhapāda Sutta About Potthapada Asked about the cause of the arising of saññā, usually translated as perception, the Buddha says it is through training; he explains the path as above up to the jhanas and the arising of their perceptions, and then continues with the first three formless attainments; the sutta then moves on to other topics, the self and the unanswered questions. DN 10 Subha Sutta Ananda describes the path taught by the Buddha. alt: Kevaḍḍha Sutta To Kevatta Kevaddha asks the Buddha why he does not gain disciples by working miracles; the Buddha explains that people would simply dismiss this as magic and that the real miracle is the training of his followers. DN 12 Lohicca Sutta To Lohicca On good and bad teachers. DN 13 Tevijja Sutta Asked about the path to union with Brahma, the Buddha explains it in terms of the Buddhist path, but ending with the four brahmaviharas; the abbreviated way the text is written out makes it unclear how much of the path comes before this; Robert Gombrich has argued that the Buddha was meaning union with Brahma as synonymous with nirvana. DN 14 Mahāpadāna Sutta Tells the story of a past Buddha up to shortly after his enlightenment; the story is similar to that of Gautama Buddha. DN 15 Mahanidāna Sutta The Great Causes Discourse On dependent origination. DN 16 Mahaparinibbāna Sutta The Last Days of the Buddha Story of the last few months of the Buddha's life, his death and funeral, and the distribution of his relics. DN 18 Janavasabha Sutta King Bimbisara of Magadha, reborn as the god Janavasabha, tells the Buddha that his teaching has resulted in increased numbers of people being reborn as gods. DN 19 Maha-Govinda Sutta Story of a past life of the Buddha. DN 22 Mahasatipaṭṭhāna Sutta The Great Discourse on the Foundations of Mindfulness The basis for one of the Burmese vipassana meditation traditions; many people have it read or recited to them on their deathbeds. alt: Payasi Rājañña Sutta Dialogue between the skeptical Prince Payasi and a monk. alt: Udumbarika Sutta Another discourse on asceticism. DN 26 Cakkavatti Sihanada Sutta The Wheel-turning Emperor Story of humanity's decline from a golden age in the past, with a prophecy of its eventual return. DN 27 Aggañña Sutta Another story of humanity's decline. DN 28 Sampasādaniya Sutta Sariputta praises the Buddha. DN 29 Pāsādika Sutta The Buddha's response to the news of the death of his rival, the founder of Jainism. DN 30 Lakkhaṇa Sutta Explains the actions of the Buddha in his previous lives leading to his 32 bodily marks; thus it describes practices of a bodhisattva (perhaps the earliest such description). alt:Singala Sutta, Singalaka Sutta or Sigala Sutta To Sigala/The Layperson's Code of Discipline Traditionally regarded as the lay vinaya. DN 33 Saṅgāti Sutta L. S. Cousins has tentatively suggested that this was the first sutta created as a literary text, at the Second Council, his theory being that sutta was originally a pattern of teaching rather than a body of literature; it is taught by Sariputta at the Buddha's request, and gives lists arranged numerically from ones to tens (cf. Anguttara Nikaya); a version of this belonging to another school was used as the basis for one of the books of their Abhidharma Pitaka. DN 34 Dasuttara Sutta Similar to the preceding sutta but with a fixed format; there are ten categories, and each number has one list in each; this material is also used in the Patisambhidamagga. The Digha Nikaya corresponds to the Dīrgha Āgama found in the Sutra Pitikas of various Sanskritic early Buddhists schools, fragments of which survive in Sanskrit. A complete version of the Dīrgha Āgama of the Dharmagupta school survives in Chinese translation by the name Cháng Ahánjīng 長阿含經. It contains 30 sūtras in contrast to the 34 suttas of the Theravadin Dīgha Nikāya. In addition, portions of the Sarvāstivādin school's Dīrgha Āgama survive in Sanskrit and in Tibetan translation. Dialogues of the Buddha, tr T. W. and C. A. F. Rhys Davids, 1899–1921, 3 volumes, Pali Text Society, Vol. 1, Vol. 2, Vol. 3. ↑ "English translation of DN 9, "To Poṭṭhapada"". Sutta Central. Retrieved 2015-12-15. 1 2 3 4 "Digha Nikaya: The Long Discourses". www.accesstoinsight.org. Retrieved 2015-12-12. 1 2 "Brahmajāla Sutta: The All-embracing Net of Views". www.accesstoinsight.org. Retrieved 2015-12-12. ↑ "English translation of DN 2, "The Fruits of Recluseship"". Sutta Central. Retrieved 2015-12-15. ↑ "English translation of DN 3, "To Ambaṭṭha"". Sutta Central. Retrieved 2015-12-15. ↑ "English translation of DN 4, "To Soṇadaṇḍa"". Sutta Central. Retrieved 2015-12-27. ↑ "English translation of DN 12, "Lohicca"". Sutta Central. Retrieved 2015-12-15. ↑ "DN34 Dasuttara Sutta: Expanding Decades". www.palicanon.org. Retrieved 2015-12-12.